“Couture is about service, the salon, the vendeuse, the box, the way the clothes are wrapped and presented to the client.” These are Karl Lagerfelds words about the package of haute couture; made-to-measure garments in the most exquisite fabrics with the finest embroideries, details and workmanship. It’s the fine art of fashion and Paris is the guardian of it. On its own dates and aside from the hysteria during the ready-to-wear fashion weeks, the couture week presents the few designers and fashion houses that execute the criteria’s of The Chambre Syndicale de la Haute Couture. 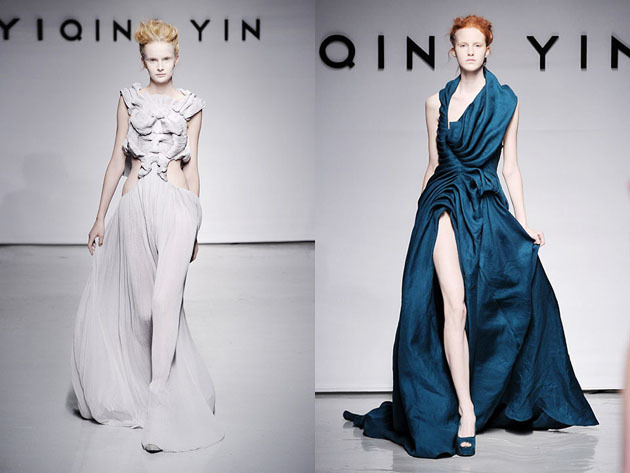 One of the selected designers is Chinese born, French based Yiqing Yin, who debuted her eponymous brand at the Hyères 2010 and was invited to present her first collection during the FW11/12 Haute Couture shows. 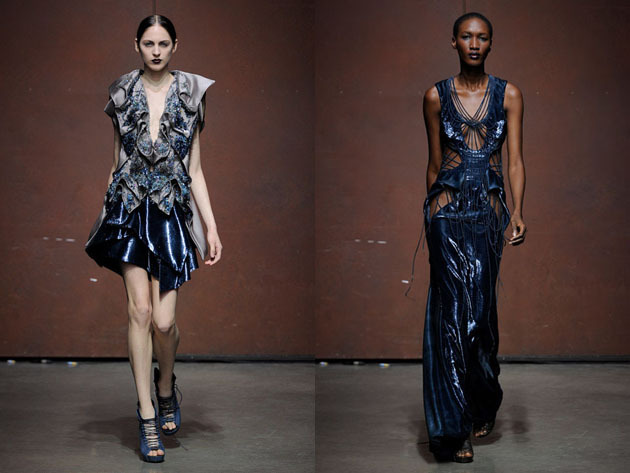 SS12 followed and the designer presented her second collection of fluid materials, sweeping dresses and a treasured handwork that makes her measure up to be one of the brands helping to preserve Paris’ position as the World Capital of Fashion. Yiqing Yin’s collection consists of simple colours, aerial garments and mixes what at a first glance may look like effortless dresses with pieces that make you want to go closer to study the meticulous cuts, embroideries and fine points that make the collection a whole. Haute couture often gets attention as the medium where fashion designers can realise themselves as artists. Even though it’s lovely to talk about haute couture as a form for the highest art of fashion, the two words that make the name are legally protected and a strictly controlled label only to be used by the fashion houses who have been granted ‘access’ by the French Ministry of Industry. Just like fine art, couture is a pricey story, and for the designer, a time consuming one. The designers of fashion houses often justify the costs by the promotional attention it brings to the brand. One would like to think that it’s all about the art, but at the end of the day, ‘the business of a business is business’; one of the reasons why the ready-to-wear industry today is the leading one. 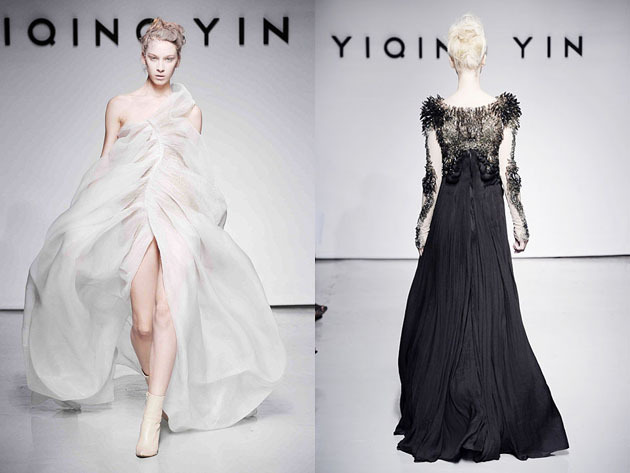 Though, young designers like Yiqing Yin, who still is all about the experiments and fully focused on the couture, reminds you that it’s the artistic minds and hours of skilled craftsmanship that are the foundation of haute couture. Because of its exploratory nature, it’s directional for fashion and the ‘heavy’ symbolic value of the art is often conveyed through the garments themselves as well as through the lavish shows. Yiqing Yin is still young in the haute couture industry, but awarded with the Grand Prize of Creation by the City of Paris, and she’s one of the 8 young designers selected by French Vogue to receive the ANDAM “Premières Collections” prize in 2011, she already has the habit of exhibiting her art, and it’s yet to be seen if she will become one of the young couturiers to make a long-term name on the Chambre Syndicale’s desirable list of designers.